Proudly Enhancing, sorting and inspiring financial lives. 2018 Financial Planner of the year Australia! Simple investment strategies to improve your lifestyle, relieve financial worry, and create long-term financial stability. 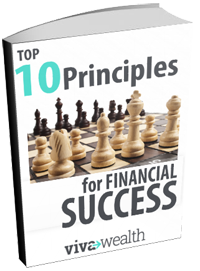 Get your complimentary copy of our “Top 10 Principles”. Just click the “Download” button. Let‘s talk about what’s truly important. In the maze of financial products and investments, some advisers seem all too keen to make a commission; they forget about you and why you came to see them in the first place. Viva Wealth is different. To us, your personal goals and values are the most important part of your financial plan. It’s only after we understand your values that we use our financial skills to help you achieve your best life. As your financial planners and advisers, we help you bridge the gap between your current knowledge and the financial steps you need to take to achieve your aspirations. What is values-based financial planning and how can it help you? Most people think financial planning is a head game all about numbers and strategies, where the goal is a larger bank balance at some point in the distant future. At Viva Wealth, we think differently. We believe a great financial plan equips you to achieve your goals while enjoying life in the present moment. That’s why we use a values-based approach that considers matters of the heart – your personal goals, dreams and core values. The result is a personally tailored financial plan for achieving the life you desire. ended up with a much better outcome with his encouragement and insight. I then setup my Superannuation with his help. He has guided and advised me ever since. …Time has demonstrated his integrity and straightforwardness, his maturity and humanity in the considered and holistic approach of his financial advice. I whole heartedly recommend Michael and Viva Wealth. Since that first meeting with Michael we were impressed with his knowledge and experience in planning our future with regards to our self managed superannuation fund. With Michael’s help, advice and information we are now settled into our retirement phase with not a worrying concern about our future with regards to finance and life style, he has put our mind at rest with our after work life and the years ahead. …He made clear the options and paths we have and because of this I would and have recommended him to others who are wanting a retirement plan. Robert Glisenti & Heidi Kaltenbrunn. Trusting our financial future with a third party was not a decision we made lightly, nor was it one that was done easily. From our first meeting with Michael we felt completely at ease. That meeting was revelatory and displayed Viva’s unique approach to our financial future. It is utterly reassuring to see Michael’s personal characteristics of integrity, honesty and approachability blend seamlessly with his professional advice and service. Our family now looks to the future with a much greater sense of assurance and excitement. Going through this important planning phase with someone holding the same values and visions as ourselves is proving to be the difference between Viva and the rest. Michael was recommended to Cathy and myself to provide retirement advice. We both knew we wanted to retire but had little understanding of the process and how to utilise our superannuation. Michael was really approachable and talked at a level we could understand which enabled us to grasp the concept and principals of self-funded retirement. From here Michael helped us plan our retirement and I feel really confident in our plan moving forward. Michael explained all options in an unbiased manner so we could make informed decisions that best suited our personal circumstances. I would have no hesitation in recommending Michael’s services in the future. Loving my retirement thanks to Michael! We’re not here to sell you products, investments or insurance. Instead, we’re here to help you make financial decisions that perfectly align with your values so you can live your best life possible.